Hillary Clinton made a total of $6.5 million in 2015, with $5 million coming from royalties from her book “Hard Choices” and about $1.5 million in speaking fees before she began her presidential campaign. Her husband, former president Bill Clinton, made $5 million on his speaking tour from banking, tech and other corporate interests. Hillary Clinton released the candidate financial disclosure form she filed to the Federal Election Commission earlier this week. The 11-page document shows that most of her personal wealth is held in a Vanguard 500 Index Fund and a separate JP Morgan Custody Account, both valued at $5 million to $25 million. Clinton’s campaign released her disclosure Tuesday night, hours after Republican Donald Trump filed a new document showing his revenue had increased by about $190 million and that his net worth now eclipsed $10 billion. Donald Trump has not released his tax returns, and Clinton used the disclosure to prod her opponent about that fact. Last year, Clinton released her own family tax returns covering 1977 to 2014. In all, Clinton made at least 94 appearances before corporate and other special interests between 2013 and 2015, earning more than $21.6 million for her services. A review of federal records, regulatory filings and correspondence by The Associated Press showed that almost all the 82 corporations, trade associations and other groups that paid for or sponsored Clinton’s speeches have actively sought to sway the government—lobbying, bidding for contracts, commenting on federal policy, and in some cases, contacting State Department officials or Clinton herself during her tenure as secretary of state. Hillary Clinton’s disclosure also shows that her husband made an undisclosed amount of money last year in consulting roles for two international interests—the Dubai-based Varkey GEMS Foundation and Laureate Education Inc., a global for-profit education firm. Bill Clinton ended his relationship with Laureate last year after earning $16.5 million as the operation’s honorary chancellor, according to previously released Clinton tax records. Bill Clinton also has made more than $5.6 million in an honorary role for the GEMS foundation. Bill Clinton used a limited liability company called WJC, LLC to handle his consulting fees, according to the disclosure filed by his wife. 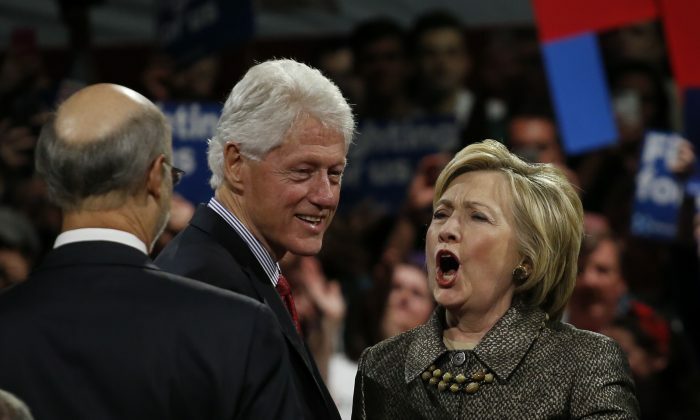 The disclosure does not detail the exact amount of consulting income Bill Clinton made because under federal reporting guidelines, any such spousal income over $1,000 is not required to be made public. Hillary Clinton also used a limited liability company, ZFS Holdings, LLC, to hold her speech and book earnings. Hillary Clinton’s 2015 disclosure showed the couple’s total worth was estimated to be between about $11 million and $53 million, according to the broad ranges typically provided by the federal form. Her 2016 filing does not provide similar ranges, but the Clintons’ 2015 earnings appear to be in line with those earlier figures.